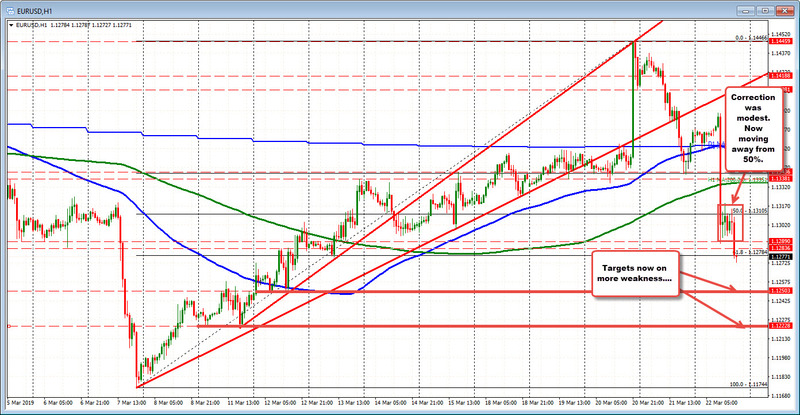 EURUSD keeps the selling pressure on. In the earlier post, I noted the subdued corrective action in the EURUSD. The pair stayed below the 38.2% of the move down at 1.1326 and was also hanging below the 50% of the March trading range. The NY session high has seen a small move above the 50% (high reached 1.13148), but momentum quickly faded. The price is now probing to new lows and moving further away from the 50% retracement level at 1.13105 (now a risk level for sellers). The price is below the 61.8% at 1.12784. Sellers remain in control.